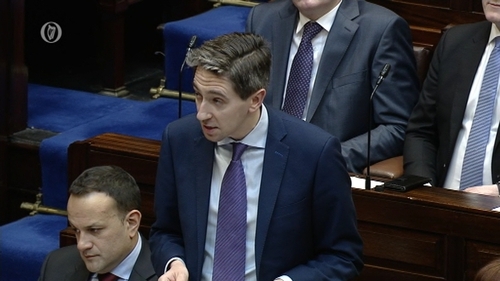 Tá leithscéal gafa ag an Aire Sláinte Simon Harris leis an Dáil agus leis an Teachta Dála Barry Cowen ó Fhianna Fáil faoin bhfreagra a thug sé ar cheist i mí Mheán Fómhair seo caite maidir leis an gcostas a bheadh ar an ospidéal nua leanaí. Dúirt an tAire Harris inniu nach raibh sé in ann eolas - a bhí rúnda ag an am ar chúinsí tráchtála - a thabhairt faoin togra. Ghéill sé mar sin féin gur cheart go mbeadh níos mó sonraí sa fhreagra a thug sé ar an gceist cúig mhí ó shin. Thug an Taoiseach Leo Varadkar le fios sa Dáil freisin go bhfuil sé i gceist ag an Rialtas moill a chur ar thograí eile le €100 milliún a shábháil agus cuid den chostas breise a bheas ar an ospideál nua a ghlanadh. Dúirt sé go gcaithfeadh an Rialtas freagracht a ghlacadh as an róchaiteachas ar an ospidéal agus go raibh ceachtanna le foghlaim acu. D'iarr ceannaire Shinn Féin Mary Lou McDonald ar an Taoiseach an tAire Harris a bhriseadh as a phost. Dúirt sí go raibh eolas ag an Aire nár roinn sé leis an Rialtas ná le Fianna Fáil.